What a fun book! Dreaming Sophia's protagonist, Sophia, is a young woman who is an aspiring artist and is passionate about Italy. She is away at college and her parents are in Rome on a second honeymoon. She receives devasting news that the plane that her parents were on bringing them home has crashed and both parents have died in the crash. Sophia is so upset by the news that she virtually hides away, still going to classes but just kind of living inside of herself and her dreams and memories. In this time we learn abit about her parents and that her mother was also an artist and Sophia inherited her free spirit and dreams from her. Sophia was named after Sophia Loren, the beautiful Italian actress, as her mother was a fan of Ms.Loren. Sophia's dreams are what keeps her going in this tragic time. Her art professor tells her about an art school in Italy that she applies to and is accepted. She needs to get away and get immersed in her art. She travels to Italy and starts her new life among the art of the Medieval, Baroque, Renaissance,and Modern periods that she loves. As I mentioned before, Sophia dreams, she dreams not just at night but during the day also, as she wanders around Florence she not only encounters the art works that she so loves, but she also dreams about historical figures such as Michelangelo, Leonardo da Vinci, Eleonora de Medici and Cassonova. The dreams are so vivid that it is like she has been transported to the era that they lived. What a fun time I had reading this book, I am not an expert on art but it was fun to learn about the works of the artists famous in Italy who have so shaped the beauty of the country. The writing was so good that it felt like I was on the Sophia's journey right along with her. The sights, sounds and smells of Italy came right through the pages. The author definitely knows of what she writes and has put her own experiences onto the page. To me that is the mark of a great author that can have the reader transported into the pages of the book. 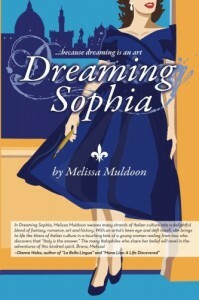 I hope to read more by this author, maybe a continuation of Sophia's story.."because dreaming is an art".